You may want to check the description of your watchface as well.. I think I've had a watch flagged for that once by the software. How can text infringe on a brand? I never said BMW. (I also can't double check it because it is GONE) This face was part of a 5 face collection I just launched yesterday. I wanted to launch all 5 at once, but STILL haven't heard back. 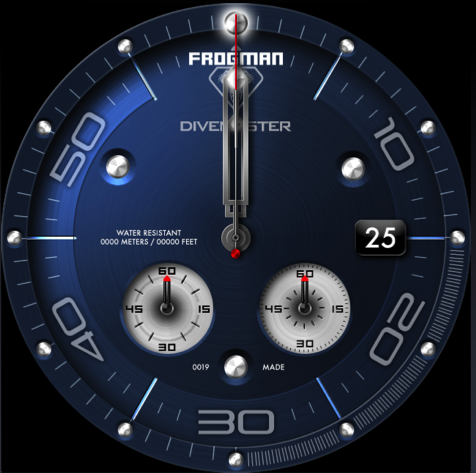 "Designed for combat, the Frogman Sniper offers unique, custom hands, date, inner rotating seconds dial, floating second hand, and the conditions every sniper needs to know before each shot; Distance to target (aka steps), current weather conditions and temp, and heart rate indicator. Yellow tritium in AOD mode. " They all basically say something similar. I don't use social media or have many friends to "share" my designs with, so my visibility on Facer is literally all from Facer. So when my work is pushed out of the top 100, way less people get to see my stuff. I've seen some people who "apply" to be a premium designer, but the platform doesn't mention applying. It says if you're good and meet all the requirements, you'll be contacted and invited.